This is another piece I designed for the store window a couple of years back. 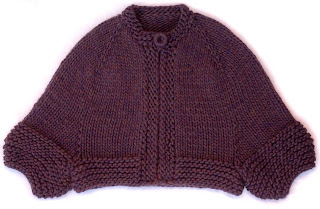 The original is a little shorter/boxier with a zipper closure made in black yarn. I wanted to post pictures of it but if you've ever tried to photograph a black sweater it's useless. The shape comes through but the details are lost. I posted about this design in June and was ready with the pattern in November but between the crazy weather and the holidays I was beginning to think it wasn't going to happen. 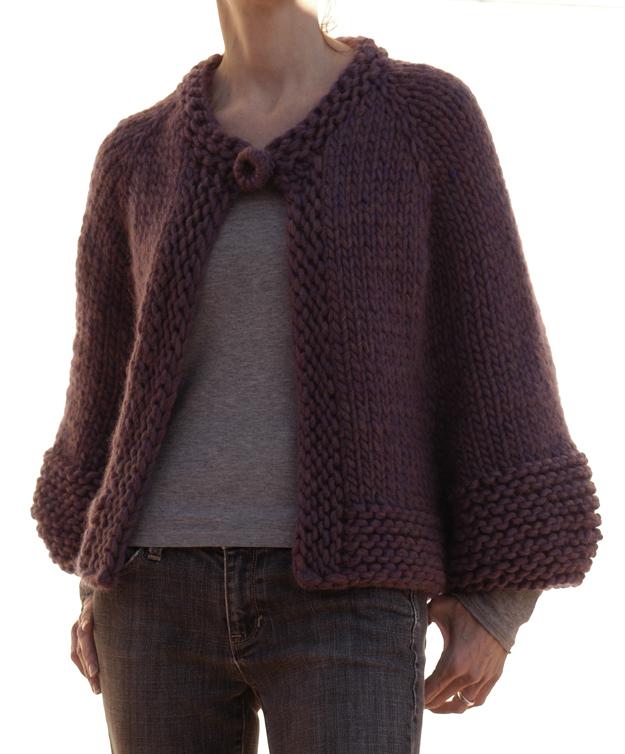 This jacket is worked from the top down in a raglan style using stockinette stitch with garter stitch finishing on the collar, facings & cuffs. 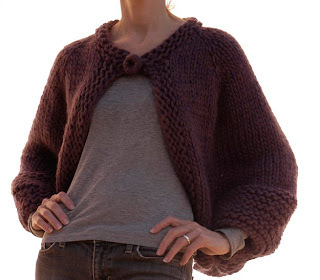 The use of different increases being the most difficult part of this jacket would make me rate it fairly easy, a great 1st sweater for a beginner looking to challenge themselves. It's really more a cape than a jacket since the sleeves don't separate from the body until the garter stitch border though the way the sleeves are shaped and the way they hang can give the illusion of being separate. I enjoyed making the buttons for "a Smart Cardigan" so much I wanted to try it with bulky yarn and I like the result. Techniques used: lifted bar increases M1L & M1R. Cast on can be a long tail or any simple cast on and picking up stitches. 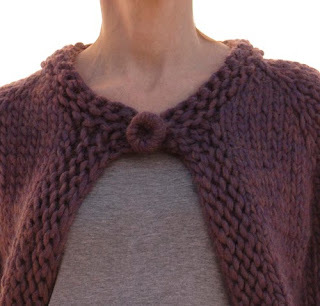 I did do a springy bind off on the collar resulting in a wider round collar when compared to the collar I made on this one which was just a traditional bind off. Besides that it's just knitting and purling. Knit on a #17 (or #19 to get gauge) with a gauge of 1.75sts & 3 rows per inch and using 3.5 (4) skeins of Cascades Magnum (123yds) this is one you could work up over the weekend. Sizes: S/M 30-34" bust; L 36-40" bust. This jacket is very generous in size. I love wearing this jacket! I like that when I'm wearing it I feel I'm dressing up my uniform of jeans and a T shirt. 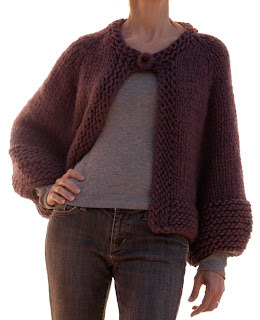 The drape and the softness of the yarn, it just feels good! WOW - another gorgeous piece! Brings to mind Audrey Hepburn. 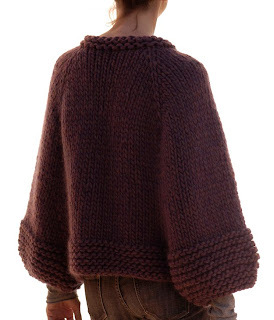 Love the elegant drape of the sleeves and the button adds such a beautiful finishing touch. Great work! Nice final touch with the handmade button. Yeah! I am so happy to finally see this pattern up for sale. I just bought my copy. As soon as I can get out of the house (snowed in in south suburban Chicago) I am hitting the yarn shop to get my yarn! You are an amazing designer, and thanks again.